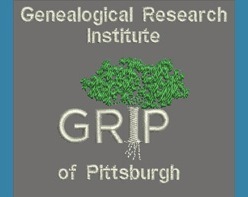 A week from today, I’ll be venturing onto the campus of La Roche College in Pittsburgh, Pennsylvania, for a week of learning at the Genealogical Research Institute of Pittsburgh (GRIP). I’ll be part of the Advanced Research Methods class taught by Tom Jones, with associate instructors Claire Bettag and Rick Sayre. Am I excited? Absolutely! Am I nervous? You bet. 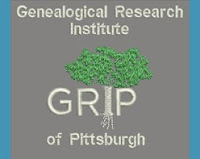 Attending GRIP will give me the opportunity to learn from some of the masters of the genealogical world in a college class setting. That’s just awesome. Still, I can’t help but wonder if my brain will be able to wrap itself around all the concepts and strategies and methodology that will be crammed into that five days. High-level genealogy morning, noon, and night. I want to soak it all in, absorb it like a sponge, so that I can use it when faced with my own research challenges. I think I’m up to the task, but along with that dash of confidence comes a touch of apprehension. Come to think of it, it’s the same feeling I had when starting college itself. And that’s just in the first hour and fifteen minutes. So I’m doing my best to get ready. I’ve been studying the articles that Dr. Jones sent us to prepare for the course, and will keep on studying them this week. Someone suggested that I review his other articles in the National Genealogical Society Quarterly, which I thought was a good idea, so I want to read some of those, too. I plan to do all the optional homework exercises he gives us, because I know I learn more—and remember more—by trying to apply the material presented in class. Last but not least, I’m starting to gather the things I want to take with me to Pittsburgh. One thing I’m really looking forward to is being in the company of other people who are just as eager to learn and discuss genealogy as I am. I know several of my classmates already, and I think it’s going to be a great group. When you add in the students from the other three courses being offered, as well as their terrific instructors--whose courses I would love to take, too--GRIP promises to be a dynamic environment all around. Read away! I'm a little jealous (only a little because I'll be driving west soon to see my favorite little guy). You will have such an adventure of learning. Enjoy every moment of your sponginess. Thanks, Susan. Wish you were going to be there, but I totally understand the pull that little grandson of yours has on you. Enjoy him! I got news for you. Thats not just the first hour...more like the first day+. Hehehe. You'll love it! Glad to know I'm not the only one who's nervous, Becky. So glad you're going to be in class with me. Looking forward to seeing you again! I'm in the Intermediate level class, but I'm also excited. I'm looking forward to meeting you. Thank you for expressing the excitement and nervousness so well. I bet you'll love the intermediate class, Karen. I took Paula Stuart-Warren's class at the Salt Lake Institute of Genealogy, and it was great. She's a fantastic instructor. Be sure to look me up at GRIP on Sunday--it will be great to meet you! This sounds so interesting. I can't go so I plan on living vicariously through your blog posts. I'll try to post some updates during the week, Amy, as long as I get my homework done on time :) Or pictures at least.